Family Fun Night with David Stokes from Whitewater Community TV on Vimeo. David has received the Master Front-line Interpreter award from the National Association for Interpretation. He sings and engages audiences of all ages in nature study. 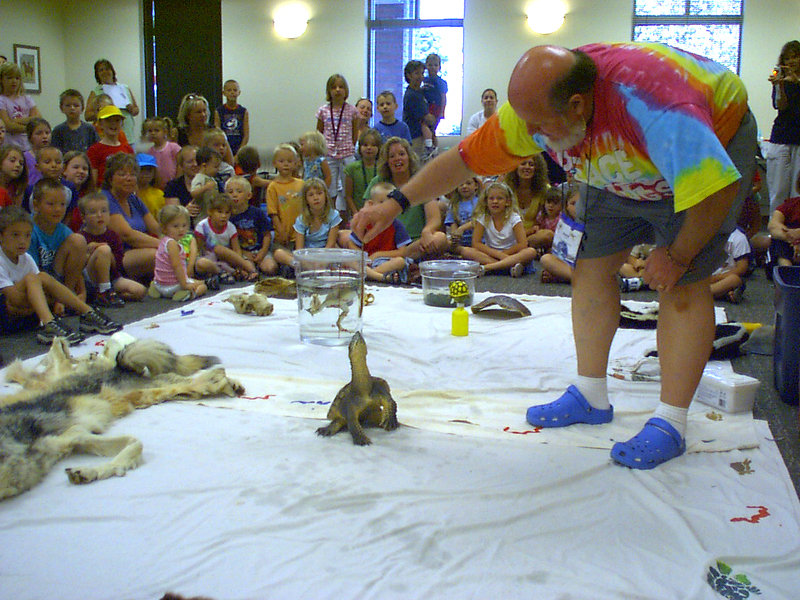 Using live creatures and animal artifacts, songs and short stories, David gets down with his audiences, and makes learning fun. David has a solid educational background in the natural sciences, holding an Masters of Science in Conservation Education from Michigan State University. He has been creating exciting learning situations since 1974. David's Philosophy? I believe in entertaining while educating. I believe no one is too old to get involved. The secret to life is to participate. The most powerful nation in the world is IMAGINATION! A four-year-old girl asked her mother once, "Mommy, is David Stokes still a kid?"